A pair of Syracuse “vetrepreneurs”—U.S. Army National Guardsmen Specialist Brian Kennedy and 1st Lt. Jason Uhlig, veterans of Operation Enduring Freedom most recently deployed to Afghanistan with the Syracuse-based 2nd Battalion 108th Infantry Regiment, 27th Brigade—are hoping to make a positive change in the world by using their talents in art and design. The friends will publicly launch their business Iron Art, a graphic design and marketing solutions company, this Friday, Nov. 23, at a free benefit event and limited edition T-shirt launch party from noon-4 p.m. upstairs at the Syracuse Dinosaur Bar-B-Que, 246 W. Willow St. The launch includes sale of a new “Combat-Dino” T-shirt designed by Iron Art that features the iconic dinosaur sporting military apparel and featuring a uniform-style flag and customized soldier silhouette on the sleeves. Proceeds from T-shirt sales will benefit the work of the Institute for Veterans and Military Families at Syracuse University (IVMF) in supporting veterans and military families post-service, including its portfolio of entrepreneurship training programs. In addition, proceeds will also support the Warrior Salute program of Rochester-based CDS Monarch, which provides employment opportunities, clinical rehabilitation and family support services to help veterans with post-traumatic stress disorder and traumatic brain injury transition into civilian life as happy and productive members of their community. 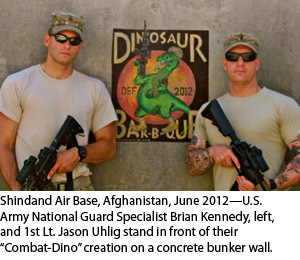 The story behind the “Dino makeover” was born while Uhlig and Kennedy were serving in Afghanistan. They were inspired by both their military experiences and the community support back home and wanted to find a means to demonstrate their thanks in return. They received numerous care packages, and among their favorites were those containing Dinosaur Bar-B-Que sauces. Knowing that the chain of eateries has a strong tradition of supporting the military and veterans, the pair decided the combat make-over would demonstrate their love for the establishment back at home and its unique taste and bring a little piece of Syracuse to Afghanistan. Haynie and representatives of Warrior Salute/CDS Monarch will provide brief remarks on how their services support veterans and military families as part of the event. For more information, contact Uhlig at 315-263-6918 or ironart315@gmail.com.